A NY Times article entitled "Any Other Bright Ideas? ", on the pros and cons of compact fluorescent lights (CFLs), appeared in their House&Home section on 1/10. It had a lot of useful information, and provided interesting perspectives by various families that have tried the bulbs. Unfortunately, the article gave greatest prominence to the negative aspects of some bulbs, and at one point was completely contradictory. What the consumer needs is information on which bulbs produce pleasing light, yet this information was buried deep in the article, likely to be missed by all but the most thorough readers. The n:vision bulbs are available at Home Depot, and perhaps other locations. They come in different warmths of light, so look for the color-coding on the package to find a bulb with more yellow and less of that "daylight" blue. Those with the green-colored packaging are the most pleasant indoors. As I found out while helping a friend convert her office to fluorescents, the compact variety still take a minute or so to reach full brightness. When first turning on a 100 watt equivalent CFL, you're likely to think you got a raw deal, since it appears considerably dimmer than the 100 watt incandescent bulb it's supposed to replace. Give it a minute, though, and it will glow as brightly as the incandescent did, and use only a quarter of the energy. The 60 watt n:vision, however, instantly generates a bright light, so essentially imitates an incandescent bulb. Some people are hesitant to use fluorescents, citing the dangers of the mercury they contain. There are various arguments against letting such a concern rule your decision: The amount of mercury they contain is minute and is sequestered in the bulb. Trace amounts of mercury are already present in our environment. Using fluorescents reduces the amount of mercury released from power plants. Anyone who has a manual thermostat or a non-digital thermometer in the house is already sequestering far more mercury than a household's worth of CFLs. For more detail on mercury in CFLs, try http://www.slate.com/id/2183606/ and http://www.energystar.gov/ia/partners/promotions/change_light/downloads/Fact_Sheet_Mercury.pdf. Below is the link to info about the great film festival at the Princeton Public Library, in its second year, happening now through January 12. I'll be making a slide presentation entitled "Restoring Native Habitats In Princeton Preserves and Backyards" on Saturday, Jan. 12 at 1:30. All screenings and talks are free and open to the public and are in the Community Room at the Princeton Public Library, 65 Witherspoon Street, Princeton, NJ. For rooms with recessed or track lighting, or where dimmer switches make fluorescents problematic, it may work better to simply create a fluorescent alternative in those rooms rather than replacing the more wasteful bulbs. That way, when the room isn't being used but one wants some sort of light on, a lamp or overhead with a florescent can be turned on, with the other lighting reserved for times when you want additional or more ornate light. Compact fluorescents are cheaper than most articles say. Recently, I found both 60 and 75 watt equivalents selling individually for 75 cents each at Walmart (strangely, packages of multiple bulbs in another display in the same store were more expensive per bulb) (One a subsequent visit, the bargain display had disappeared--a "one time deal" according to one of the employees). The big box hardware stores usually have 60 watt equivalents for $1 each these days (As of 1/16, they are more like 3 for $5). In Princeton, the town's effort to reduce energy consumption began with an assessment of the municipal buildings' energy use. If this makes sense for a town, then maybe it makes sense for a home. 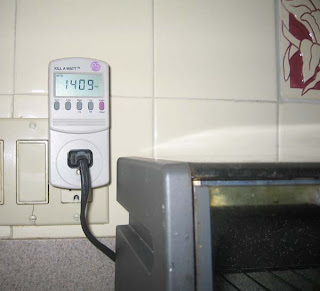 The Kill-a-Watt is a useful tool for getting a handle on some of your energy use. (They are available over the internet, but not locally.) It can test anything that plugs into a regular wall socket, up to 1850 watts. Obviously, toasters are not toasting the planet, but check other appliances and you're sure to find some unnecessary drains on energy. The device is particularly good for finding and measuring the energy used by electronics even when they are off. 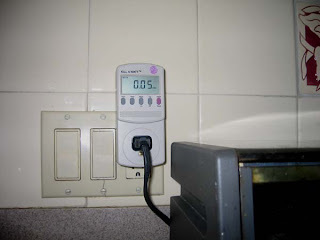 An October 21, 2007 post gives more info on what various appliances use.